For as long as I can remember, I have always been one to prefer solid deodorants over gel ones. Solid deodorants are literally no fuss and the fact that they involve no dry-down time is an absolute plus for someone like me, who is always on a time crunch. Also, I never found gels to really do much for me when it comes to keeping my underarms dry. In it's defense though, no antiperspirant/deodorant hardly ever does-yes, even solids. But with solids I feel a little bit more "secure", if that makes any sense. Anyway, a number of solid deodorants have one major caveat. They usually leave unflattering white marks on clothing. Super annoying to deal with, especially when it occurs on dark clothing. I received Secret's Outlast Clear Gel Antiperspirant/Deodorant ($4.59) in my complimentary Spring Fever VoxBox from Influenster, and this product not only sets out to provide 48 hours of odor and wetness protection, it's also toted as leaving fewer white marks on clothing when compared to other invisible solids. Although with this being a gel formula and all, I was more than open to giving this a go. I had nothing to lose. What intrigued me most about this product was that it tackles a couple of issues that are of concern to me. For instance, my underarms have the tendency to get a bit moist throughout the day-especially during this time when the weather starts to warm up. Not only is it uncomfortable, but it's also a little embarrassing when the wetness becomes excessive enough to seep through the clothing. It has been unbelievably hot here in New York City, so what better time to give this antiperspirant/deodorant a try, and see what it could do? I forgot how refreshingly cooling gels are-such a nice treat on warm days. This clear gel is very pleasant to apply, and I love how gentle it is on my sensitive underarms. 1-2 dials is usually all it takes for complete coverage on both underarms for me. Oh, and the best part? Almost no dry-down time. Score! 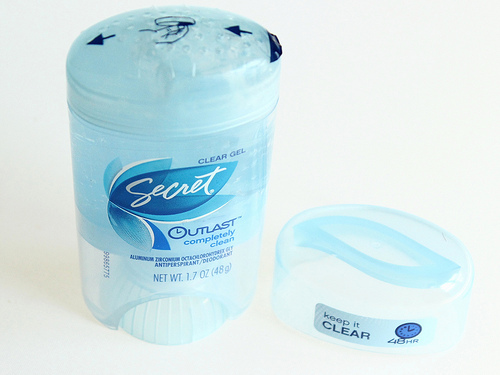 Secret's Outlast Clear Gel Antiperspirant/Deodorant didn't completely keep me dry throughout the day. But it did reduce the wetness a nice deal. I noticed that my underarms weren't as moist like they otherwise usually are. Pretty impressive I think, especially in 90 degree weather. I just can't get enough of the lovely clean fragrance. This stuff totally has me covered when it comes to odor protection, by keeping me smelling fresh all day. And, since the gel is clear, I don't have to worry about it marking my clothing. Yay! Overall: Although I don't think I will give up my solids anytime soon, it's nice to have a gel antiperspirant/deodorant on hand that I am comfortable using. If you are one who doesn't sweat excessively, and are looking for a fresh gel antiperspirant/deodorant that leaves the risk of clothing marks out the door, I think this is an interesting product to look into. 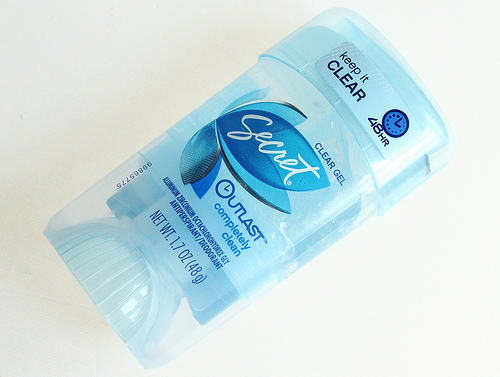 What do you all think of Secret's Outlast Clear Gel Antiperspirant/Deodorant? Disclaimer: I received this product complimentary from Influenster for testing purposes. My reviews are always honest, never influenced, and my own.